Happy Thanksgiving, Melissa and Mudpie! 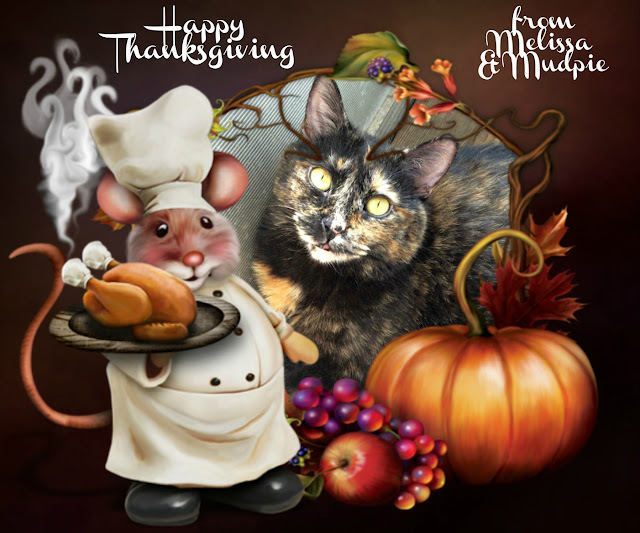 Happy Thanksgiving, Mudpie and Melissa! Too cute! Happy Thanksgiving, Melissa and Mudpie. What a beautiful holiday post! Happy Thanksgiving! Happy Thanksgiving, Melissa and Mudpie! Wishing you health, happiness and much magic! Mudpie, who is your mouse friend? Hey you're not going to EAT that mouse for Thanksgiving, along with the turkey are you? Love to both of you for the holiday! Happy Thanksgiving to the two of you! Happy Thanksgiving to you and Mommy, Mudpie! We are grateful for you! Sooo cute!! Happy Happy Thanksgiving to all of you!! Bless your sweet face. Happy Thanksgiving. Happy Turkey Day! Make sure you get some. Happy Thanksgiving from all of us sweet friends, y'all rock! Thanks for joining the Thankful Thursday Blog Hop! We hopes you hads a purrfectly yummy Thanksgiving and a furry goods furryday too. First of all, this is the cutest Thanksgiving art ever, Mudpie! Second, I am so sorry we're so late to visit you, but we hope your Thanksgiving was blessed and filled with family and food!